The whole area stretches out over more than 400 kilometres, is home to more than a thousand temples, and attracts more than two million visitors a year. I would recommend taking two days out of your time in Cambodia to visit all the temples, as trying to squeeze them all into a single day would be tiring to say the least! This also means that after an early start and a busy morning trekking up and down and through the temples, you can spend the rest of your afternoon relaxing in the city with an Angkor beer in hand! 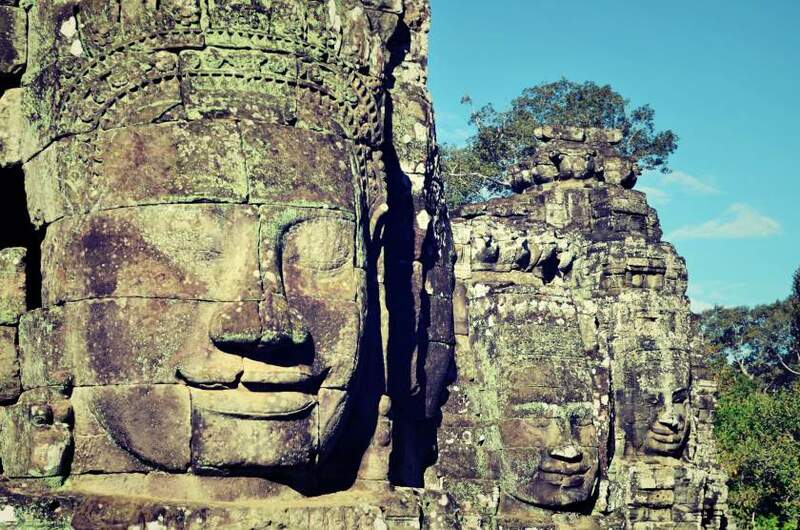 It goes without saying that this is the most famous, the biggest and most spectacular archeological site not just in Cambodia, but in the world. Whether you do the temples independently by bike, take a tuk-tuk (recommended) or by coach, most tours will get you here before sunrise, and you’ll see for yourself why. After seeing it in so many photos and on so many postcards, watching its beautiful silhouette emerge out of the darkness and light up in front of the stunning orange light behind, you have to pinch yourself to remind yourself you’re actually there! Originally founded as a Hindu capital for the Khmer empire, it gradually transformed into a Buddhist temple by the end of the 12th century. 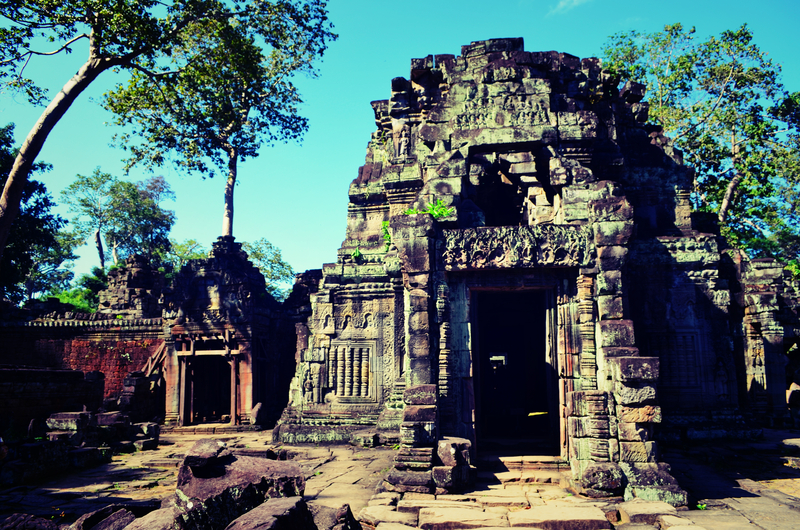 As far as its architecture goes, it is at the top of the high classical Khmer style. Dedicated to the Hindu god of Vishnu, it was built as the king’s state temple and capital city, and was designed to represent Mount Meru, home of the devas in Hindu mythology, with a moat and an outer wall. Etched into the temple walls are ‘devatas’ and bas reliefs showing epic Hindu stories. Climb to the top of the central towers and look out at the surroundings, wander through the intricate arches and out into the big courtyards…You can easily spend several hours wandering around the temple – but make sure you arrange a time and place to meet up with your tuk-tuk driver or tour group as there are so many crowds, it’s easy to get lost! Angkor Thom, literally ‘Great City’, is my personal favourite of all the Angkor temples. Carved into the stone are the beautiful faces of the Buddha gods, Hindu gods and the ancient kings looking in all directions. Many still remain but it is estimated that there were originally around 200 of them! Again built by king Jayavarman VII, who had decided that his empire would never again be vulnerable at home, a massive moat to protect against any invaders would have run beyond the eight-meter high walls, and at each corner was a Sanctuary Tower and five entry gates. The gates each feature a tower topped by four huge faces – the most fascinating way to enter is through the south gate, which is flanked by 54 gods and 54 demons. It is a real architectural gem. Although a lot smaller than its sister Angkor Wat, this one is a lot more intricate, with dark and narrow passageways and tight staircases rising to three levels. At this temple, a young local tour guide latched onto us and we appreciated having him teach us about the history and ancient stories, as well as lead us to certain nooks and crannies where we could get some great photos of us nose-to-nose with the stone faces! After this, you will come across the Bayon Elephant Terrace, before heading back to the entrance to pick up your transport! I loved exploring this temple! A buddhist temple dedicated to the king’s mother, Ta Prohm was home to more than 12,500 people and contained gold, silk and pearls. Unlike a lot of the other temples which are being restored all the time, this one has been completely left to the elements and has consequently been swallowed up by the jungle. Giant trees and their roots sprawl up from the ground and around the temple walls, its sandstone has beautiful pink and blue tones and you really get the feeling of being an early explorer. The whole place has a sort of magical and medieval feel, as if it has always existed and is part of the earth around it. It’s not hard to see why it was this temple which was the set of the famous Tomb Raider films. 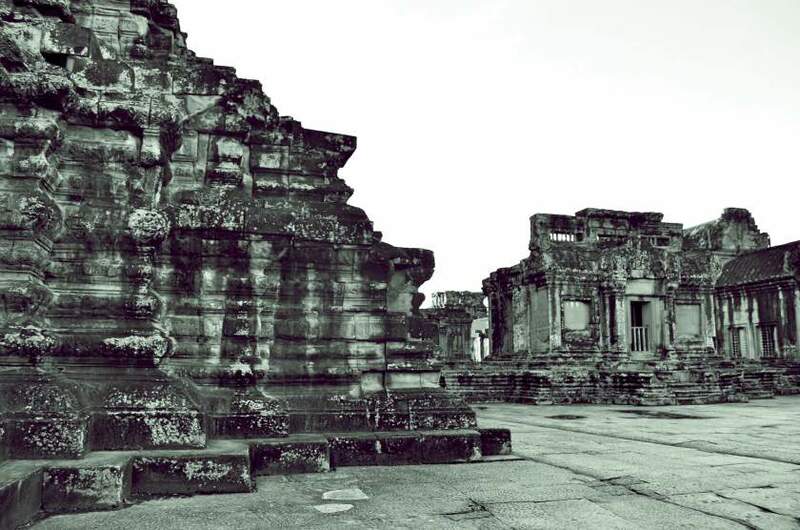 This is one of the oldest temples at Angkor and is believed to be the first built entirely of sandstone so it has a greenish colour, compared to the deeper brown or greyish colour of the other temples. With two giant steep staircases to the top on either side (which is an effort to climb in the scorching afternoon heat, but very worth it once you get to the top! ), it is essentially a five-tiered pyramid. 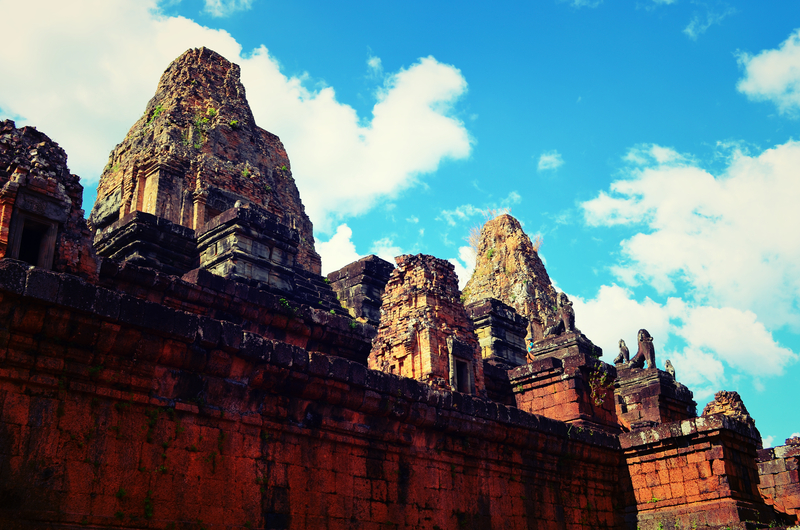 Ta Keo was built as the state temple of Jayavarman V, who started the construction when he reached 17. Legend has it, however, that the temple was struck by lightning before the work was finished, and it was then abandoned – with all the main structural work complete but no external carvings. So this is why this one is much less intricate than a lot of the others. Preah Kahn was built by king Jayavarman VII and thought to be his temporary residence whilst Angkor Thom was being built. As both a Buddhist and a Hindu temple, four ceremonial walkways approach the gates of the temple – the eastern one dedicated to Mahayana Buddhism with large doors, and the others dedicated to Shiva, Vishnu and Brahma with significantly smaller doors to emphasise the unequal nature of Hinduism. 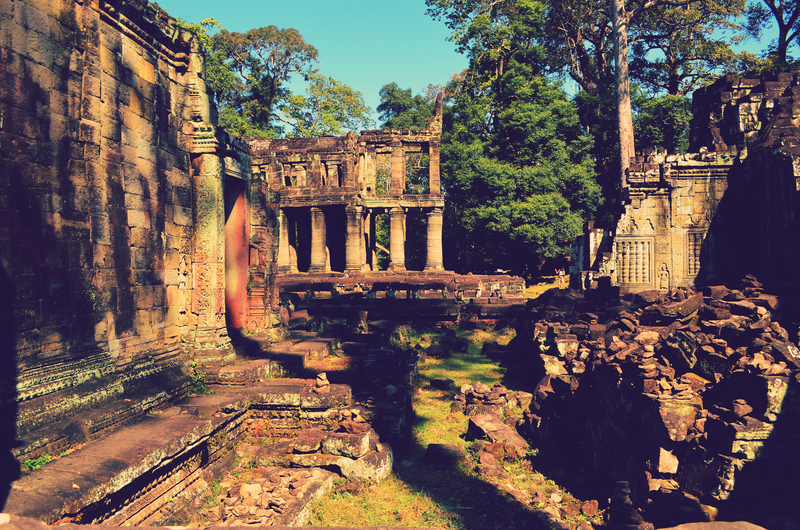 This is one of the largest complexes of Angkor, and I recommend taking your time to wander around it – it is beautiful. With its three central spires, the beautiful Pre Rup, dedicated to the god Shiva, looks a bit like a mini version of Angkor Wat. Made of grey sandstone, which is less durable than that of the other temples, Pre Rup and many of its intricate carvings have been left to erode by the elements, and hasn’t undergone much construction in its time. Despite all this, the architecture is still magnificent in both its design and size. 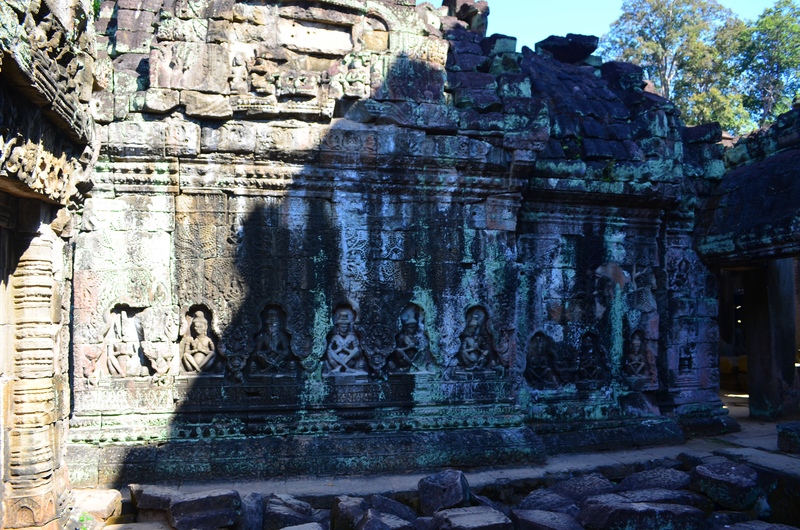 Similar in design to Ta Prohm, this one is slightly smaller, less complex, and a lot less is known about its history. 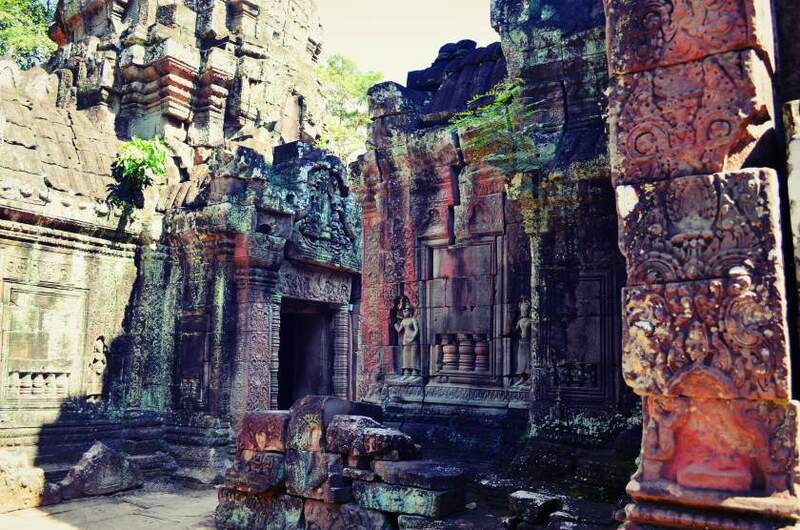 It’s presumed that it was built around a similar time to Ta Prohm, and that Banteay Kdei was a Buddhist monastery as hundreds of Buddha statues have been excavated from the site. As you are journeying around the Angkor area and between the main temples, your guide will no doubt stop at several other destinations. As well as these mentioned, we were also lucky enough to explore the smaller Neak Pean, set in the middle of a lake and accessed by a beautiful walkway over the water, Ta Som, and East Mebon and a peek at Sras Srang Lake. 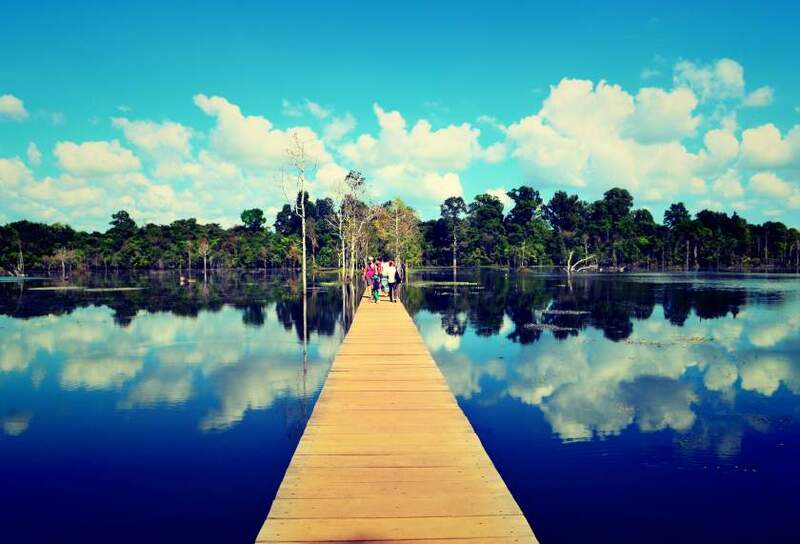 Angkor really is the jewel of the kingdom of Cambodia and an unforgettable travel experience. For more on what to include when planning a trip here, see my post: Temples & Tuk-Tuks in Cambodia.